Within Teamwork Projects, you may need to make a change to an existing task that has been added to a project. 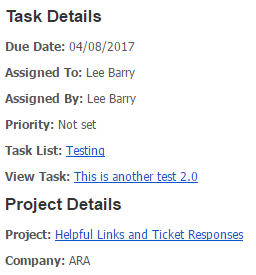 When you make a change to an existing task you can choose to notify people via email of these changes. Note: If the task is assigned to you only, you will get an email notification. If the task is assigned to multiple people including you, you won't get notified but the other people will. To enable the email notification when you make any changes you must check the Notify by Email box highlighted below. The email will include the details of the changes made to the assigned task. It will include who made the change, what task the change was made on and it will list the individual changes that have been made. It will also include the task details.